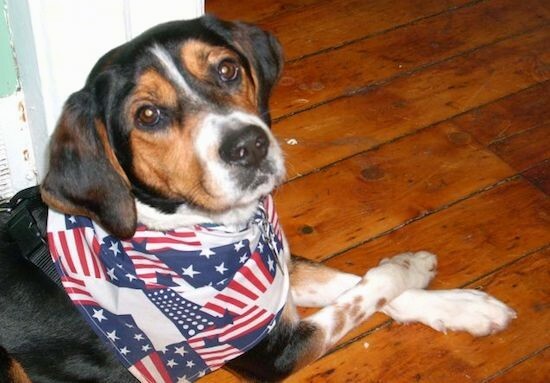 "This is Captain Jack our Blue Tick Coonhound / Beagle mix. I adopted him from a family in NY who bought him for a 91 year old neighbor who had just lost his dog. He couldn't handle the dog (Jack is very energetic) so the family took him back but couldn't keep him themselves as they have a dog already. I brought him home and he IS home now. The way he is laying in this picture is the way he lays all the time. Crosses his front legs as if to say, "I'm so pretty"!"